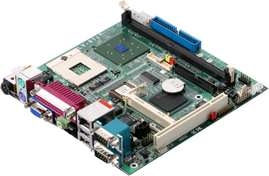 COMMELL LV-671 is an all-in-one industrial compact Pentium M level Mini-ITX platform based on Intel 82855GM and 82801DB Chipset, which offers a highly integrated low power, high performance chipset solution that has been optimized to support the IntelR Pe - or Dual-channel LVDS panel support up to UXGA resolution. The LV-671 comes with floppy, PS/2 Keyboard and Mouse, 2 x RS232C, UltraATA 100 EIDE and IrDA interface on-board, Networking is provided by Intel 82540EM Gigabit Ethernet. Six USB ports and 5.1 channel Audio are also integrated. A Mini-PCI slot is availab lot to use Mini-AGP add-on card. Additionally, LV-671 is also equipped with PCMCIA and CompactFalsh Interface for easily using any communication and memory card. The single DC supply is another important feature for embedded system integrator. COMMELL LV-671 is requiring 12VDC or 19VDC only, Moreover, The board features a protective design to prevent when input voltage rises up to unexpectedly voltage. 1 x PS/2 keyboard and mouse port. and Mini-PCI or Mini-AGP port can be used optionally.